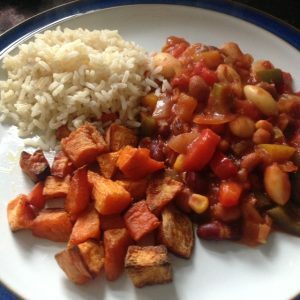 Delicious, flavourful meal which is simple to make and pretty healthy too! Peel and chop the onion and deseed and chop the peppers. Cook for 5 minutes stirring regulary then add the remaining ingredients. Add a small amount of water if needed. Simmer for 30 minutes.